MILLERSVILLE, MD – Today’s home fires burn faster than ever. In a typical home fire, you may have as little as one to two minutes to escape safely from the time the smoke alarm sounds. Knowing how to use that time wisely takes planning and practice. The Anne Arundel County Fire Department is teaming up with the National Fire Protection Association (NFPA), the official sponsor of Fire Prevention Week, to promote this year’s Fire Prevention Week campaign, “Look. Listen. Learn. Be aware. 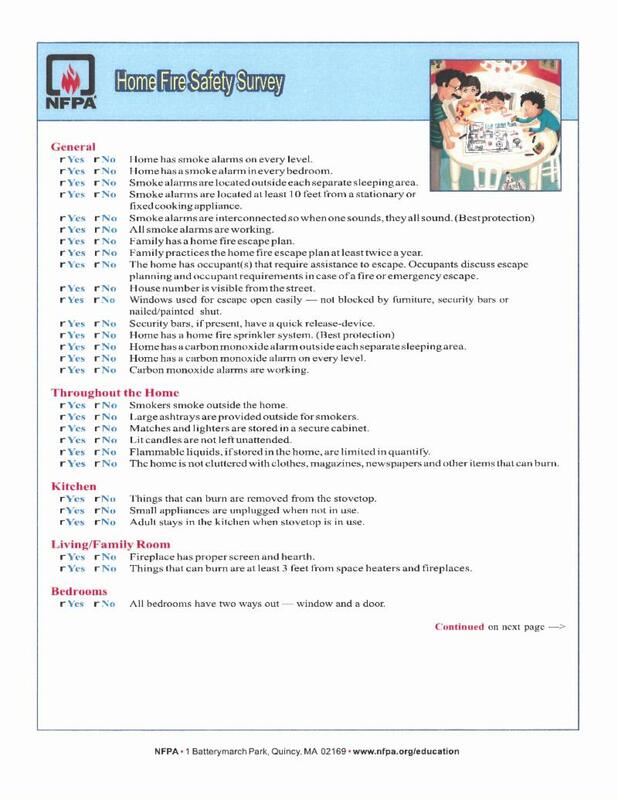 Fire can happen anywhere,” which works to educate the public about basic but essential ways to prevent and quickly and safely escape a home fire. 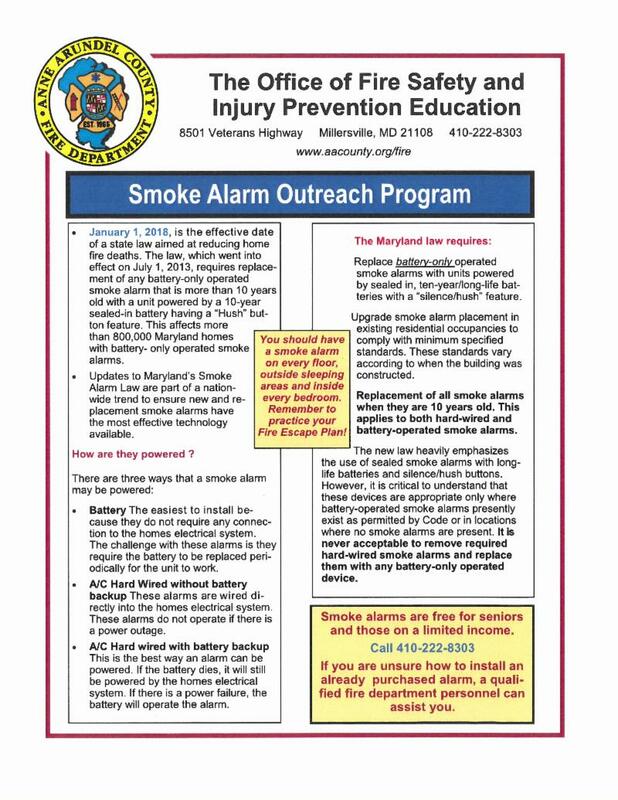 “Tragically, six Anne Arundel County residents have died in four fires in 2018 in spite of the homes having working smoke alarms,” said Fire Chief Allan Graves. “Knowing what to do in that critical time when your smoke alarm is sounding is crucial to your ability to escape safely,” he said. This year’s “Look. Listen. Learn.” campaign highlights three steps people can take to help quickly and safely escape a fire. Learn 2 ways out of every room. Make sure all doors and windows leading outside open easily and are free of clutter. NFPA statistics show that the number of U.S. home fires has been steadily declining over the past few decades. However, the death rate per 1000 home fires that are reported to fire departments was 10 percent higher in 2016 than in 1980. From January 1, 2018 to August 30, 2018, the news media have reported 1,651 home fire deaths according to the United States Fire Administration. Look for places fire could start. Take this Home Fire Safety Survey to determine if you are prepared and to help you look for places where fire could start. Listen for the sound of the smoke alarm. January 1, 2018, was the effective date of a state law aimed at reducing home fire deaths. The law, which went into effect on July 1, 2013, requires replacement of any battery-only operated smoke alarm that is more than 10 years old with a unit powered by a 10-year sealed-in battery having a “Hush” button feature. Find more about the requirements of the law here . Learn 2 ways out of every room. Find information here on how to develop and practice a family escape plan. 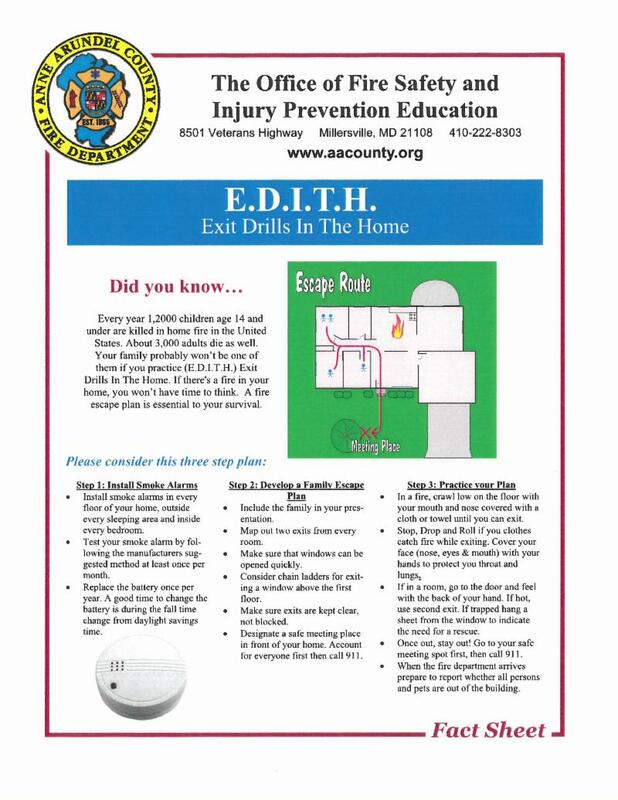 For more information about Fire Prevention Week and home escape planning, visit www.firepreventionweek.org .The Anne Arundel County Fire Department has a free home smoke alarm program offered to county residents in need of smoke alarm checks and replacement. Visit our website for more information. ← County Police Drug Bust!